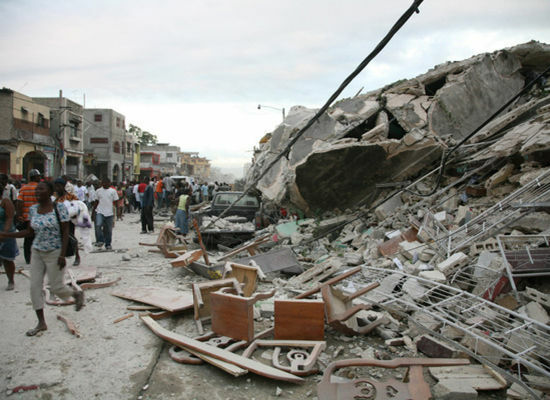 PORT-AU-PRINCE, Haiti — Haitians piled bodies along the devastated streets of their capital Wednesday after a powerful earthquake flattened the president's palace, the cathedral, hospitals, schools, the main prison and whole neighborhoods. Officials feared thousands – perhaps more than 100,000 – may have perished but there was no firm count. Death was everywhere in Port-au-Prince. Bodies of tiny children were piled next to schools. Corpses of women lay on the street with stunned expressions frozen on their faces as flies began to gather. Bodies of men were covered with plastic tarps or cotton sheets. President Rene Preval said he believes thousands were killed in Tuesday afternoon's magnitude-7.0 quake, and the scope of the destruction prompted other officials to give even higher estimates. Leading Sen. Youri Latortue told The Associated Press that 500,000 could be dead, although he acknowledged that nobody really knows. You can donate to relief efforts through Doctors Without Borders, the Solidarity Center's earthquake relief fund, or Wycelf's Yele foundation.